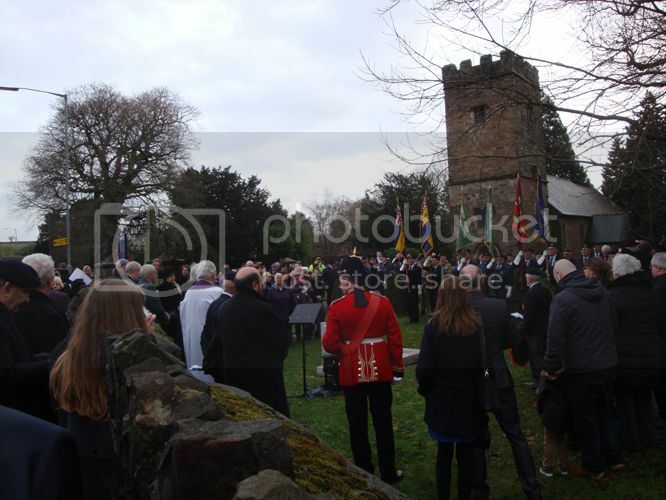 rorkesdriftvc.com :: View topic - John Williams/Fielding VC annual memorial service 2014. The Parade will assemble at (10:20) Abbeyfields and proceed to the Church at 10:40 for the Service at 11:00. The Parade will re-assemble at 11:20 and return to Abbeyfields for dismissal at 11:30 or, in the case of inclement weather, in the Car Park of the Greenhouse Public House. All welcome, but be mindful that there will be road closures leading up to the event and limited parking. Is this still on, please? Hi, to the very best of my knowledge, yes. Could be squelchy underfoot assuming they've had the odd shower down there of late. The Graveside Service, conducted by the Reverend Frieda Evans (Curate, St. Michael and All Angels, Church), will commence at 1100hrs: Guests are, however, requested to be at the Church by no later than 1030hrs on that morning to await the arrival of the Parade at 1050hrs. The Blaenavon Town Band will lead the Parade of representatives of CADESA, The Royal Welsh Regimental Association (Pontypool Branch) and the Royal Engineers Association. Please be aware of the naturally undulating terrain within the grounds of the Churchyard: at all times and to protect your personal safety, exercise great care in this area and the route from the car park to the graveside. The Landlords of The Greenhouse Inn have kindly agreed the use of their car park on that morning and so you are encouraged to make use of this facility. I am also given to understand that the Inn will also be open for coffee / teas (from 10:00) should you wish to purchase them. Please be aware that a ‘Temporary Road Closure’ will be in force in the area of the Church / Parade route from 1030hrs and road access will be prohibited from that time. It is therefore important that you adhere to the times as stated above. We are very grateful for the support of Torfaen County Borough Council and Gwent Police in the organisation of this Community Event and your co-operation in terms of the above arrangements would be appreciated. The commemoration ceremony was very well attended, and thankfully with no rain. Also there were Peter and Colin Fielding and his daughter. Martin Everett was also there. 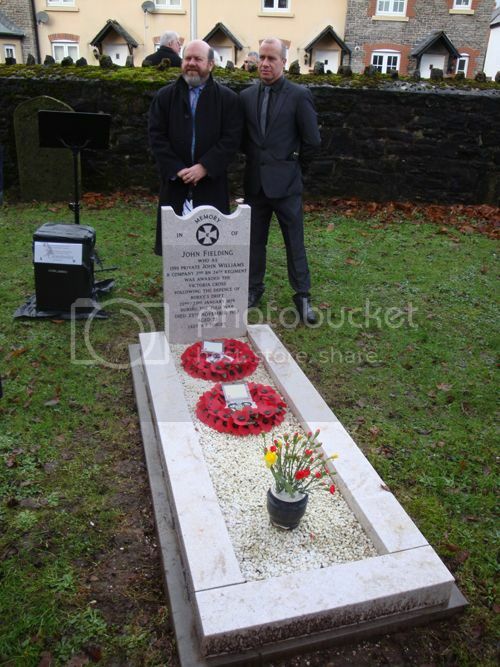 Peter & Colin Fielding at the recently replaced headstone. Good turnout - thanks for the pictures. Unfortunately, I wasn't able to make it - but I'm pleased to hear that it went well; well done! Do we have a date for the 2015 ceremony yet, please? it's normally held on the Saturday nearest the 22nd January which would be the 24th ( rather fitting , being the 24th ! ). I'll find out for definite. as expected, the memorial service will be on 24th January, 2015 at St. Michael and All Angels Church, Llantarnam, Cwmbran. Thanks very much - I hope to be there this time! Nice one, will probably be in The Greenhouse and/or The John Fielding Pubs the night before if you're about? Hope to be there on the day as well. Where is the John Fielding pub? The John Fielding pub is in Caradoc Road,Cwmbran. It's near the town centre. There is a car park behind it but is normally full. There is a free multi storey just along the road. Yes, FREE !!!!!!!!!! The pub is a typical wetherspoons offering. Pleased to say it is usually well populated. I think I've checked this before on street view. Doesn't look like the sort of place I'd go out of my way for. Is it themed inside?